BREAKING: GRAND EGYPTIAN MUSEUM ON FIRE. The museum just caught fire today, Sunday the 29th of April, however the cause of the blaze is still unknown. It appears that the fire started on some scaffolding and then moved to the attached conference centre. All workers and employees were evacuated with zero injuries reported so far, and ten fire trucks were called to the scene to extinguish the blaze. The Grand Egyptian Museum is still under construction and scheduled to have a soft opening in May 2018. It is set to be one of the largest museums in the world, sitting on 50 hectares of land and should house many artefacts from the Egyptian Museum as well as many more coming back home from abroad. Looks to be quite a big fire. No doubt the opening will have to be delayed. From what I understand the Japanese have give Egypt a long term loan of around $300 Million, which is a little over half the total cost of the project. Originally budgeted to cost $550 million, the GEM was partially funded by a Japanese loan of $300 million. As costs rose, a further $460 million was negotiated from the Japanese in 2016. The latest estimates for cost approach $1 billion. The Japanese obviously have confidence in Egypt's ability to repay loans - having loaned the country over $6 billion in 2017 alone. Newcastle and A-Four. God knows what the final cost will be but my clear understanding is that the Jap finance 'facility'/debt is $US800-900 million to produce the largest museum in the world and also the ugliest. Also there is no museum in the world of any standing in such an ugly and remote site. Hawass planning - genius that he is and friend to 1 or 2 posters on this forum who have been mute for 5/6 years after years of gushing. What country in the world funds its museums with 100% debt - what accountant advised on that? I think the Japs know the debt will never be repaid or repaid in a trivial and theatrical way. Its written off. As everyone knows it was designed by some Irish kids who had never won a big contract, and have never since, and had no prior experience in public buildings. When the Egyptians called them to give them the contract they didn;t have a business office - their only contact was a home phone number and no one was at home. Another Hawass good judgement - idiots with no quals. doing important things. It suits Egypt well. Its huge beyond belief when compared with the Louvre, Metropolitan and British. Its unbelievably ugly and fascistic just like appalling Egyptian public and private architecture since 1952. Its disgusting beyond belief and another waste of the taxpayers money in a poor country. It also tells you all you need to know about the taste and judgement of the immortal ruling class. Garbage. It achieves, however, the most important thing in terms of Junta thinking. Intimidation and power. 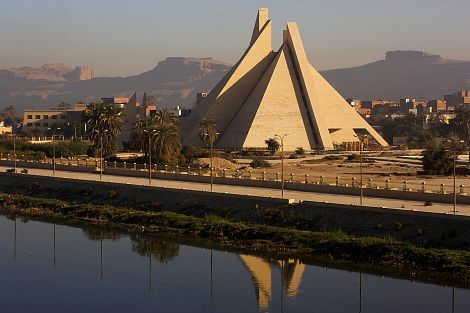 Its not a museum which is likely to make visitors feel comfortable, warm or welcome but it might be slightly less ugly, in terms of exterior, than that other horror - Luxor. One thing about a dictatorship - they always produce the world's worst buildings. Name one major museum or art gallery in the civilized world that intimidates and overwhelms. Its an obvious rule that only Egyptian idiots have ignored. The only possible positives are the storage/display/viewing/research/conservation facilities for the artefacts, and it may attract more visitors. I think the GEM is rather impressive. Beauty is in the eye of the beholder. More important is the choice of structural engineer (Arup) and main contractors ( Besix & Orascom)...all eminently qualified. 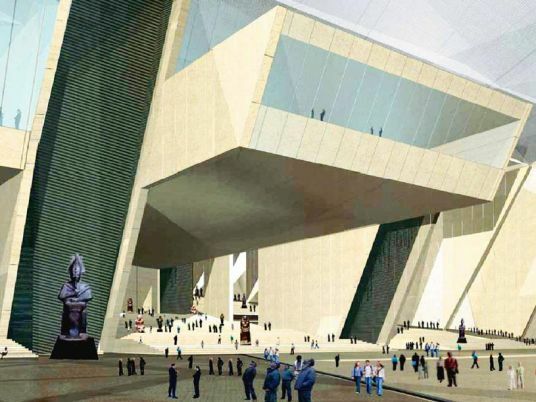 "Egypt is currently building two new museums - the Grand Egyptian Museum and the National Museum of Egyptian Civilisation - while nearly all the country's current museums suffer mismanagement, poor upkeep, low visitor turnout, and financial stagnation." "Unless cultural management is overhauled and revolutionised, the fate of Egypt's two new museums is likely to be similar to that of other museums in the country." "There is a conflict of interest here: on the one hand there is a desire to establish world-renowned museums, and such institutions need to be independent to fulfil their potential. On the other hand, these new museums must fit within a centralised state bureaucracy that sees culture, ambiguously defined, as manageable by the state for its political interests. Successful museums thrive away from the oppressive control of governments. Yet Egypt has been and continues to be governed by an oppressive state structure that interferes heavily in the daily lives of citizens through mechanisms of censorship and surveillance - where even the displays in a museum are viewed through the lens of national security." I like it. I like that it is so modern, but with reference to its neighbours. But then, unlike many, I've always loved the pyramid in the forecourt of the Louvre. I love the contrast with the OTT palace around it and the surprise when you look down inside, or up when down there. I love the contest with the modern foyer and the shopping arcade with their luxury goods with the ancient foundations and the ancient luxuries and artefacts within. If you are restoring, you copy but make it obvious. If you are extending or building to relate, make it obviously new. Ancient artefacts against modern buildings stand out more clearly, enhancing their beauty/features. Fussy old buildings can blur them. If you like modernity - and pyramids - you might like the new Akhenaten Museum at Tel el Amarna/Minya. Not finally completed yet, although I believe the visitor's centre is open. I think they were hoping to get the Nefertiti Bust from Berlin on loan when it is finished and inaugurated. Fat chance! Yes, I've been following its progress, thanks. I do indeed like it, and have it on my To Visit list. Japan will be providing Egypt with a concessional loan worth USD 451 million to resume construction of the Grand Egyptian Museum, Egypt’s cabinet announced on Sunday. The expression on a wing and prayer comes to mind with regard to the whole business. As regards Egypt you are!